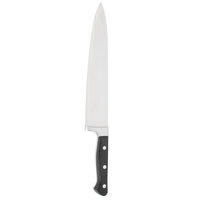 This 10" chef knife features a comfortable, riveted POM handle. Each 10" chef knife features a forged, no stain German steel blade that is durable and well-balanced. Great price for the quality! It's pretty long so I don't use it as frequently as the 6 inch one of the same style but it has come in handy a few times. It makes cutting larger vegetables easier and it came it handy recently when I was cutting a large amount of eggs all at once for egg salad. I do think this size is good to have even though you may not use it everyday. Hi all! Got these knives 2 month ago and still very happy! Didn’t have problem, knives very sharp, light and great part for commercial kitchen. I was pleasantly surprised with the quality of the knives that I bought. They are really sharp and nice and definitely do what I need them to do. This is a well-designed knife and the blade comes very sharp. The handle is easy to grip and will not slip out of your hands easily. This is great for everyday use for any setting. I would recommend it. I was skeptical, but for the price this is a great knife. The same steel as some of the more expensive knives, but at half the price. It's razor sharp and I got the one with the full bolster shown in the pictures. My only complaint is that it's a bit on the thin side, making it light and giving the blade some flex. Wow what a great deal on a chef knife! It is sharp and cuts your vegetables and meats smoothly. The handle is easy to grip. This is our knife of choice at our shop. Once you go to a 10 inch blade, it's hard to go back to any other length. This knife is nicely balanced and versatile. We use it for all of our cutting needs. Love to use this knife when I filet fish. The grip on this product is really great plus the handle has a nice finish on it. I love this knife! It is well made and the blade is very sharp. It will not slip from your hands and it cuts easily. This is great for any restaurant. This is a fabulous forged knife for the price. I originally bought the 6” and liked it so much that I bought the 10”. You will not find a better knife at this price point. The knife itself was fine, but ten inches ended up being much longer than I imagined. We eventually gave it away and settled for a much more manageable, 8" blade. Great knife to have in your kitchen, cuts meats, veggies, and sometimes bread - very well. It's got a nice handle with an easy grip. Recommend. The perfect 10 inch chef knife with POM handle and full tang blade that is artfully constructed for the ideal kitchen prep knife. The blade is sharp and strong and perfect for slicing through potatoes and cabbage. A great tool to have! This is such a good knife for the price! It has a full tang, a nice handle, and a long, sharp blade. Excellent price point! A very sharp 10" chef knife with Pom handle and full tang blade. Use this to cut your fresh fish to perfect portions every time. Nice looking, comfortable holding and well made knife that comes sharp and stays sharp at a price that is unbeatable. I will be buying more soon. What a great knife! The sharp blade makes cutting everything so easy! Our fruits, veggies are now sliced perfectly!. It also has a comfortable grip. This knife is incredibly sharp out the package, lightweight but not flexible and feels really good in your hand. The only negative is there are a few pin point rust spots on the blade only after two weeks of use. The positive side of this knife is that it is great quality steel for the price. It shipped nice and sharp, holds its edge well, and is fairly well balanced. Unfortunately The knife I received is not the same as the knife that is pictured. The knife I received does not have the full bolster that the pictured one does. This leaves the thin steel of the knife blade to dig into your finger, making doing a lot of cutting very uncomfortable. I received a knife that wasn't Styrene and doesn't look like the picture, but it was still a good chef knife. It came very sharp right out the package and feels well balanced. the 10 inch size made the knife a versatile kitchen knife for all around use, however after using it for 3 days the blade became dull quicker than expected and needs to be resharpened. Would recommend this knife for everyday use. This 10 inch chefs knife has stayed sharp after repetitive use, fits well in hand, and balanced. Cleans easy and you can not beat the price. I purchased about 4 of these as extra knives through out the kitchen. They are sturdy and durable. They work great and help get the job done so my staff can be even more productive! Wonderful 10" knife. Nice sharp blade and is able to all our kitchen needs from meat to slicking and dicing vegs. Great feeling handle, well built. This is a great knife for chopping or cutting it has a nice blade that is very sharp and has a little weight on it not flimsy. Bought this for my husband who wanted a "real" chef's knife. We've had it for 1.5 years now, and it's a fantastic knife -- cuts great and feels good in your hand. These are those durable knives that you have had in your kitchen for years. Fancy knife sets are awesome, but every kitchen should have at least one of these. These are good knives that take a lot of abuse and last for years. The rivets on the handle have started to come out on our after years of use, but they are still useable. Bought this knife for cutting 18 pound primeribs. it easily cut through .makes very nice slices. I find the staff using for other items. Going to order more in other sizes. This is a good solid knife. I like that it is full tang, so it feels substantial. It keeps an edge well, so I don't have to sharpen it very often. Bought this knife as a knock around to keep in the kitchen to be abused by the prep crew. It's a decent knife, holds an edge pretty well and is full tang. Loses points for build- for cutting carrots and potatoes it cuts like an axe, does not slice. Otherwise, recommendable. This 10" chef knife is identical to its 6" variant. Together, they make an excellent set that will suffice for 90% of what you will do in the kitchen. These knives are made with exceeding quality and are an unbelievable value. They are forged rather than stamped which results in a much stronger and sharper blade. Though they are made in China, they use very high quality carbon steel that takes a very sharp edge and holds it for many uses in between sharpening. They are also very well balanced and provide great control and comfort. The best chef's knife you will ever buy for so inexpensive. I have paid way more and was not nearly as impressed, this knife is a beast, wouldn't take three times my money back on it. Love, love it. This is a big knife made of high quality steel with a full tang. It feels balanced despite its length. If you're unfamiliar, the 10 inches refers to the length of the blade, not the entire knife. This is a great knife for the price. It's really solid, has a full tang, and a nice profile for cutting. A great value compared with plastic handled knives. A great knife that has several uses and we have used it extensively over the past couple months and finally sharpen it two day ago. The price is great too. This knife is made very well. It is the equivalent of the Wusthof or Sabatier knives I also use, and at about a tenth of their price. And the size always elicits Crocodile Dundee jokes. This knife is wonderful. The fit in my small hand is wonderful. I bought this to use this when cooking with friends. Compares to much more expensive knives I own. I have had this product for a week now and have used several times. Very pleased with the quality and you can't beat the price. This knife is very well built and has a heavier weight to it to make all your cutting requirements easier. A nice purchase for a decent price! I love this 10" Check Knife. We bought one for the house after using it at the restaurant. It's the main knife that I use for everything and it hasn't failed me yet. The last pair of knives I owned for the house were cheap ones from Walmart so it was a huge difference. Very sturdy and well balanced. I am not sure you can get any better 10-inch chef knife for this price. I am happy with my purchase. I love chef knives for starting off in a kitchen! This knife is good for students!! Great weight makes it easy to butcher and breakdown proteins!! This is a very heavy duty knife, they are made to last. The shape and the weight of this knife are just what I was looking for. This is one of my favorite knives around the shop. And for this price you can't go wrong.